Sargent Shriver's spirituality and faith in God cannot be separated from his work and life -- indeed, it was expressed throughout his work and life. His faith in God defined his choices -- during adolescence and into adulthood, throughout school, and growing a family, and why and how he forged a career in public service. 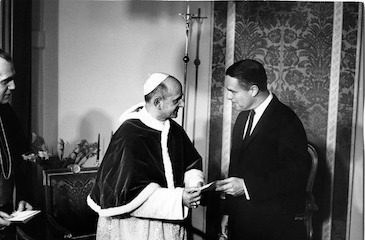 Sargent Shriver was a devout Catholic. Early on, there were many positive, Catholic influences in his life. The Shriver family often shared their summer vacations with Baltimore Cardinal James Gibbons. Gibbons was also Sarge's godfather, and deeply influenced him. In addition, Sarge's parents were engaged in the national Catholic discourse and launched CommonWealth Magazine, which still exists today. They also opened a Catholic bookstore, where Sarge spent afternoons working after school. In keeping with his Catholic beliefs, he spent his life promoting social justice and helping the poor and disadvantaged. In 1979, in his Address to the National Assembly of the Laity Conference at the University of Notre Dame, Sarge enthusiastically endorsed the new Pope (John Paul II), because he told the audience, we should not stand aside from the problems of the world or seek asylum in a monastery or convent, in the desert, or in any other retreat from the world. Quite the contrary, he insisted - his message, in effect, was that people must get involved: "Christians are needed in politics, in the law, in medicine, in the marketplace ..."
And indeed, Sargent Shriver was a faithful, devoted Catholic who served in politics, law and the marketplace. In his many public roles (in the Peace Corps, leading the War on Poverty, with the Special Olympics) -- he led efforts to provide care, support, and justice for people of all nationalities, religions, ethnicities, and capabilities. He had a deep interest in bringing people together to better understand each other and to respect each other in order to solve much of the world's social and economic inequities. His spirituality can be understood on a more personal level through this opening prayer, which he gave at the beginning of 1997 Special Olympics Board of Directors meeting. He found the athletes of Special Olympics had a much greater purpose than the world was acknowledging, or aware of, and he worked tirelessly to make everyone on this earth aware of their human value. "Almighty God, we thank you, we thank you ... for giving us a chance to work on behalf of the 170,000,000 human beings on earth with MR. For helping us to understand why you have created them! Because they teach us to love one another; because they teach us to respect all of your creatures of every race, every religion, every nation, of all ages; because they teach us that we are all -- everyone of us -- dependent on you and on one another. Help us, Lord, to respect and love all of your creatures and all of your creation. Help us, Lord, because we are your servants! Amen." Scott Stossel, the author of Sargent Shriver's biography, pulls all these spiritual themes together and writes, "Rather, what Shriver derived from his faith was less the solace of Lord's presence, less the promise of transcendence in the hereafter (though he did derive both of those qualities from his faith) than a kind of mobilizing vision for action here on earth. It is telling that in the 1930s Shriver invited Dorothy Day to speak at his undergraduate institution, Yale. Shriver's Catholicism was in some ways analogous to Day's: rooted in the ethics of the Christian Gospels; dedicated to working toward peace, social justice, and redemption of suffering here on earth; and concerned especially with the easing the plight of the poor and the disabled."